This Air Force Falcons Mini Garden Flag Marker set includes a 4 x 8 inches mini flag and a 6 x 14 inches steel mini garden flag holder. This officially licensed minature flag is made of 1-ply polyester, has screen printed logos (opposite side is a reverse image), and the included holder is made black powder coated steel. These garden flag markers are great to use as flower pot toppers, garden cane toppers, garden markers, or flower bed markers. 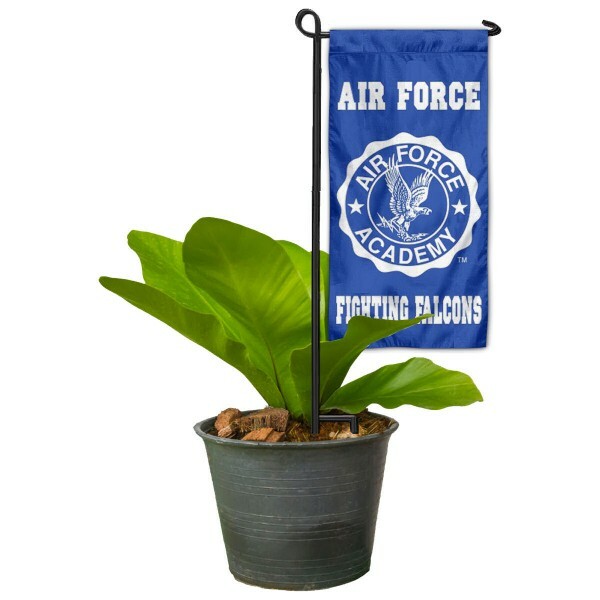 This Air Force Falcons Mini Garden Flag Marker is a unique way to display your team spirit and a great gift for your gardening family and friends! To view our larger full size garden flags and stands, see our Garden Flags selection.